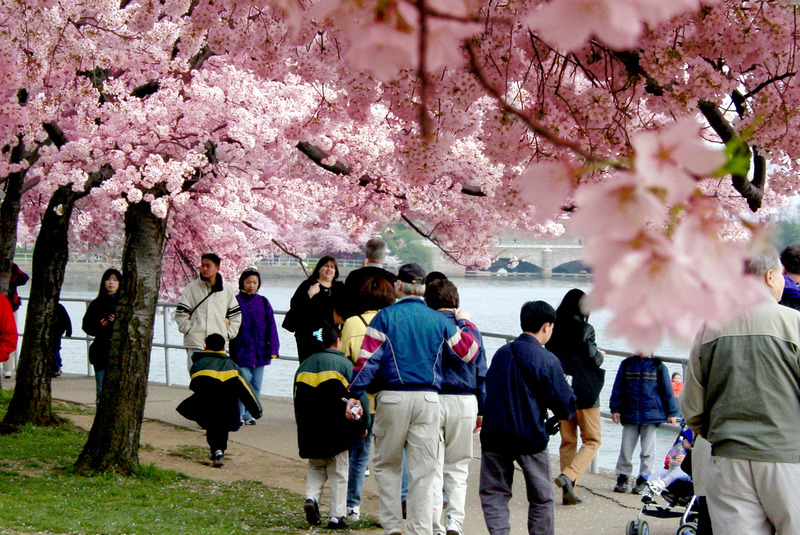 We always know when it’s Spring in Washington, D.C. – the city comes alive with our glorious cherry blossom trees (celebrating their 100th anniversary this year with an extended National Cherry Blossom Festival, having been gifted to the United States by Japan in 1912) – and we begin to see the “annual migration” of hundreds of groups who come to the nation’s capital to participate in educational, leisure, and business events, taking in the beautiful sights while they’re here. For some, the visitors are viewed as an annoyance because they crowd the subways and sidewalks, as well as daily lunch spots and favorite shops. For others of us, however, we welcome them with open arms, right along with the arrival of the cherry blossoms and the warmer weather. In particular, we welcome our international visitors, who, last year, spent $153 billion dollars while visiting the United States. 62 million international visitors came to the United States in 2011, an increase of 2.5 million over 2010. These 62 million visitors spent 14 percent more on travel and tourism-related goods and services last year than in 2010. Their spending supported an additional 103,000 travel and tourism industry jobs! These figures come on the heels of President Obama’s January 19th announcement implementing new initiatives to significantly increase travel and tourism in the United States. The industry plays a vital role in supporting a robust economy and should be recognized for the positive impacts it makes. As part of the initiatives to increase travel and tourism in the United States, President Obama created a Task Force for Travel and Competitiveness last month to build on this momentum and continue to create jobs. In the announcement, the President charged our Secretary of Commerce, John Bryson, and Interior Department Secretary Ken Salazar with developing recommendations for a National Travel and Tourism Strategy to promote domestic and international travel opportunities throughout the U.S., thereby expanding job creation for our industry. The Task Force is primarily focused on strategies for increasing tourism and recreation jobs by promoting visits to our national treasures; our national parks, wild refuges, cultural and historic sites, monuments and other public lands that can attract travelers from around the country and the globe. As part of those efforts, Commerce’s International Trade Administration supplies the travel and tourism industry with important data, including international arrivals to the U.S., the forecast of international travel to America for over 30 countries, and estimates of the total impact of travel and tourism on the economy, among others. In December 2011 alone, international visitors spent $12.6 billion on travel to, and tourism-related activities within, the United States, which is a 9 percent increase over December 2010. Travel and tourism-related exports increased, on average, more than $1.5 billion a month in 2011. Instead of viewing our guests as a nuisance to be avoided, I’d recommend saying “thank you” to the next group of visitors you encounter. They’re helping support your friends and neighbors through their spending, and they’re helping us all continue to bolster the economy! To learn more about Commerce’s efforts to increase travel to the United States, please visit the Office of Travel and Tourism Industries.